Yes, I am quoting an old L.A. Guns song from the '80s, in case you're curious about the title of this entry. We announced today, through Heidi MacDonald's blog at Publishers Weekly, that in September, we (the "we" here is primarily Dean Mullaney) will be collecting Alex Raymond's masterful RIP KIRBY series in deluxe hardcovers a la our Eisner-winning TERRY & THE PIRATES. For those who don't know Alex Raymond, or have only seen bits of his work in the form of Dave Sim's new comic GLAMOURPUSS, you're in for a treat. 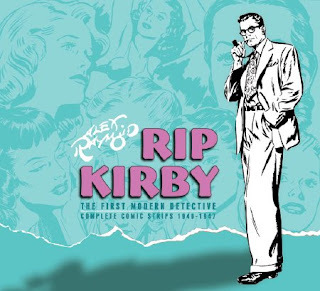 Following the Eisner-award winning Terry and the Pirates, IDW’s Library of American Comics will present Alex Raymond’s modernist classic Rip Kirby in a definitive five-volume archival hardcover series. Rip Kirby was the first hip and cool detective in newspaper comics. Created by Alex Raymond when he was deactivated from the Marines after World War II, it was a fresh approach to the genre, a departure from the prevailing hard-boiled style of detective fiction. Rip Kirby was urbane and cerebral, and used scientific methods as often as he used his fists when solving crimes and mysteries. But there was still plenty of action — Kirby was an All-American athlete and decorated war hero. The strip also signified a grand departure, both thematically and artistically, from Raymond’s first major creation, Flash Gordon. With Rip Kirby, Raymond wedded his incomparable brushwork to a sweeping approach to storytelling and camera movement that was missing in the more static Flash. He promulgated a new art style — one of cinematic photo-realism — that influenced such artists to follow as Stan Drake, Leonard Starr, Al Williamson, and Neal Adams. Biographical and historic essays will be written by Brian Walker, author of the best-selling Comics Before 1945 and Comics After 1945. The first volume will have an introduction by Raymond biographer and authority Tom Roberts.